Liz's Paper Loft: Baby Sleeping! Hi my crafty friends!!! I'm so happy it's Wednesday, why you ask...it's my day off! Especially this week since I only had to work Tuesday and then off again! Not so bad!!! Anyway, I'm also happy since today is 3D Wednesday at My Creative Time! I wanted to share with you a cute little sign for a friend that will be having a baby soon! She will be able to hang it on the door when her sweet one is sleeping. 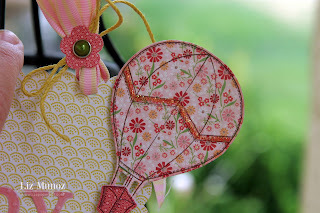 I used the Stitched Button Dies for the flower around the ribbon and hemp. Added some colored stickles on the balloon and clouds for a bit of glitz! 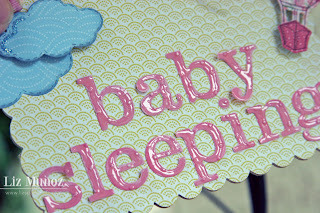 Before I attached the letters, I ran them through my big shot with an embossing folder. Then glued them down and add some glossing accents. As you can see I need to glue the "y" down, sometimes the glossy accents makes the letters curl up. But that's an easy fix. Just a few days left! Oh and there's new paper too! 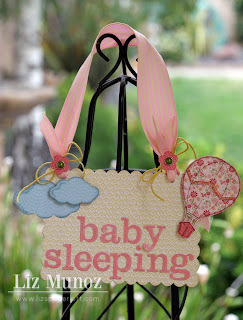 What a gorgeous baby sign Liz! I know your friend will LOVE this!! The design, the colors and papers and all the fun MCT products make this one special gift!! I really love what you create you are so talented in so many ways it always blows my mind at all the different and unique and unusual ways you come up with ideas and then run with it to create such masterpieces. You ROCK!!!! That is so pretty. I love it!! Hope you will stop by and link up at Craftin Desert Divas “Ribbon or Twine” Linky Party. Liz, this is so cute! Great job. We have a friend that just delivered...this would be perfect for her. I may have to do this with a nice lunch or dinner for her. Beautiful! GORGEOUS!!! Love the hot air balloon so pretty. 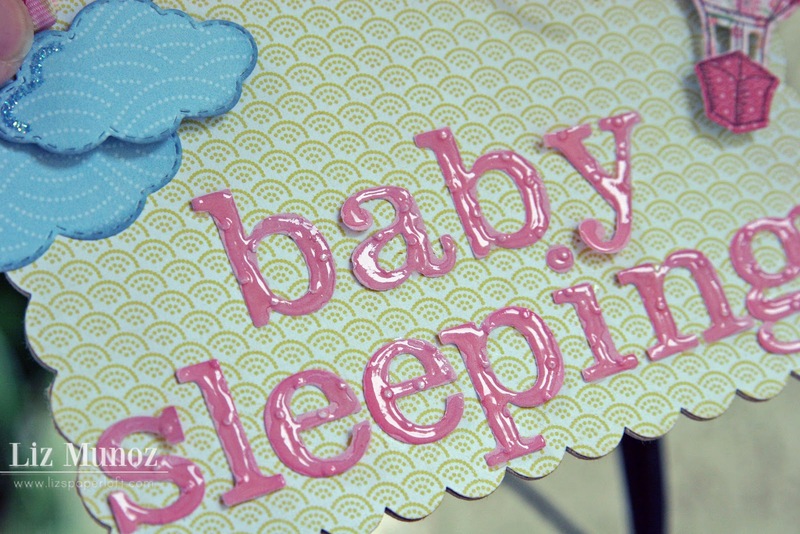 The new Mommy is going to love this cute sign! What a clever idea and I love the stickles and glossy. Great papers too. Happy 1st Anniversary! 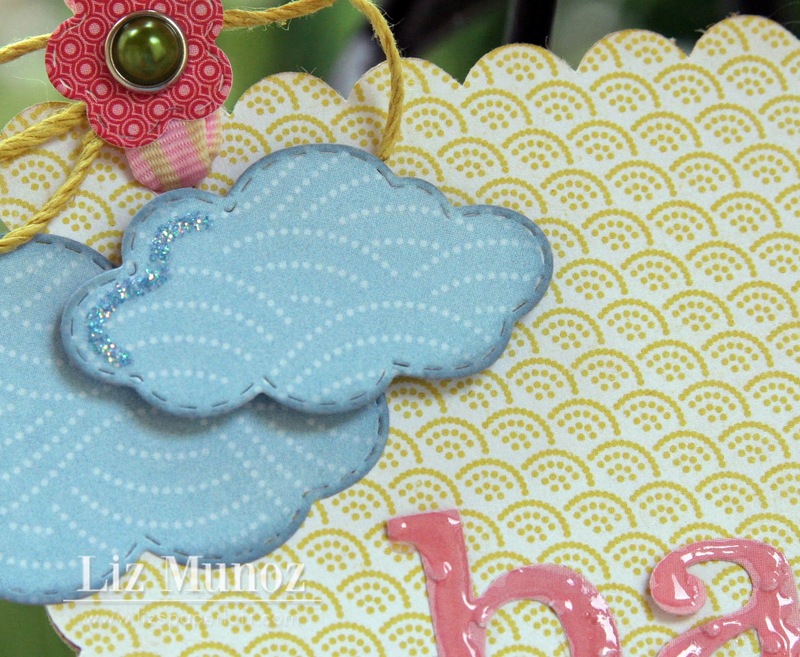 This is gorgeous and I'm sure your friend is going to love this and cherish this homemade gift! I love the glossy accent letters! ADORABLE Liz!!! The hot air balloon is so stinken cute and love the glossy accents on the letters:) So sweet! I just fell over cause you used your Cricut! lol! This is super adorable! And your picture is beautiful! Great job Liz! How adorable this is! I love that paper pieced hot air balloon and the die cut clouds! This is so darn cute! 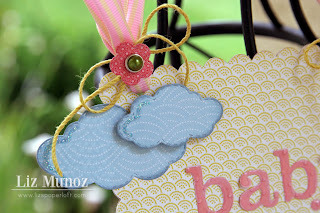 Love all the details like the glossy accents on the letters and the stickles on the balloon! This is so wonderful! Your details are AMAZING as always! And I just love your hot air balloon!! !